Hello Everyone! For todays project I have another card I made to be offered at a Holiday Card Buffet being held in a few weeks. 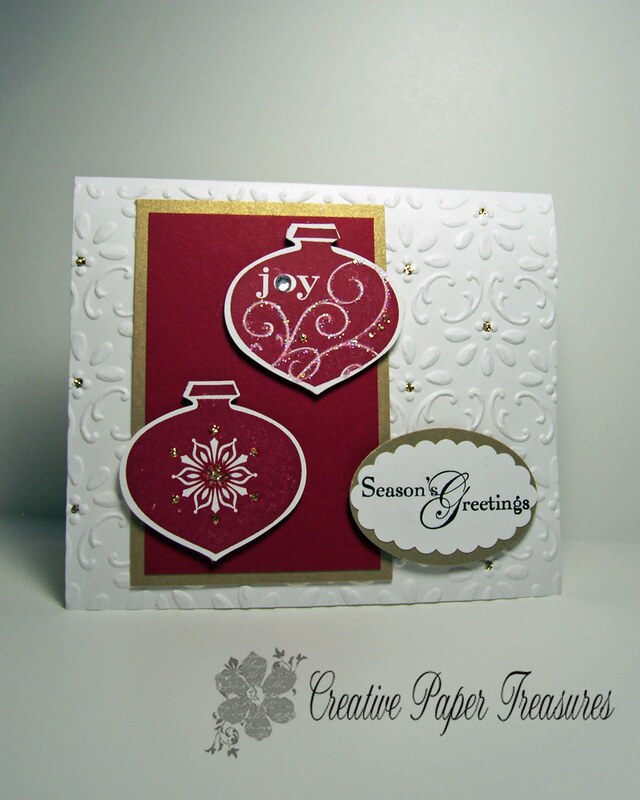 The base of this card is Whisper white embossed with the Finial Press embossing folder. The ornaments are from the Delightful Decorations stamp set stamped with Cherry Cobbler on Whisper White cardstock and punched with the Ornament Extra-Large punch and raised up with dimensionals. I added a clear rhinestone to the center of the "O" in Joy and used a glue pen and Dazzling Diamonds on the swirls. The second ornament and the center of the little flowers on the embossed layer is enhance with a little Gold Stickles. The mat layers are Brushed Gold and Cherry Cobbler cardstock. The greeting is from the Snow Swirled stamp set stamped in Basic Black on Whisper White and punch out with the Scallop oval punch. This is matted with a piece of Brushed Gold punched with the Wide Oval punch. I hope you liked today's project and would love to hear from you if you do. Accessories: Ornament Extra-Large punch, Scallop Oval punch, Wide Oval punch, Dazzling Diamonds, Glue pen, Gold Stickles, Med rhinestone.